Texas commercial trucking liability coverage provides protection for any business-owned or leased commercial truck. Policies usually include collision and damage coverage as well as coverage for property and personal damage to others. Just like you need Texas auto insurance for your own car, you need Texas business auto and Texas commecial truck insurance to cover your business-owned or leased car, truck, or other vehicle. If you, or any of your employees have an accident in your business's car or truck, you may be liable for bodily injuries, lost wages or any damage caused. Comprehensive - Protection for the loss of or damage to your commercial car or commercial truck and its equipment from all causes except collision, subject to the deductible on the policy. Collision - Protection for the collision damage to your commercial truck or car and its equipment, subject to the deductible on the policy. Hired Auto Physical Damage - Coverage for an commercial automobile or commercial trucks of any type, hired, borrowed or leased on a short term basis for use in the insured's business. Employer's Non-Ownership Liability - Coverage for a private-passenger automobile or truck used in the business of the named insured by any person, or the occasional and infrequent use of a commercial truck or automobile in the business by any of your employees. 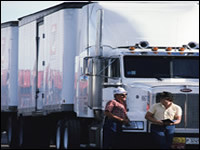 Motor Truck Cargo Legal Liability Coverage - Shippers often require commercial truckers to carry cargo coverage. Now, you can help your for-hire commercial trucking customers meet that requirement with Progressive�s new Cargo offering. It pays when your customer is responsible for damage to or loss of cargo that he or she transports on behalf of a client. The information contained in these links is provided as a public service.